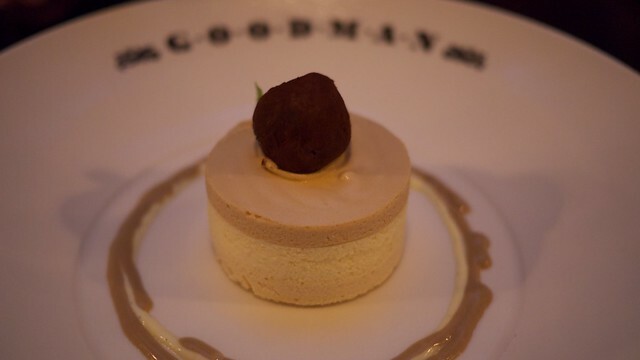 I stumbled into the Mayfair Goodman with the good lady completely by accident a few months ago. We had in fact been making our way across the West End to Byron, to try out the celebrated nuclear cheese version of their burgers, as requested by me and dozens of others. Goodman was just right there. And had burgers. And we’d just purchased an enormous skillet from John Lewis and I was trying to not kneecap passing tourists with it. It was a welcome, tobacco-coloured stop, where we had a very serviceable burger (not as drippy as I’d been led to believe) and a really quite jaw dropping beef carpaccio. Fast forward to August and the new cunningly-placed Bank branch is running a three day soft launch. It’s an address that will ensure generations of long boozy banker lunches and the wine list has been knowingly selected to match the expenses drubbing it will no doubt be fuelling. It was a simple visit, especially when we had to pass on the full steak experience previously. I’m a huge fan of the upmarket steakhouse. It’s an American export that is wholly welcome in London, where our steak has been bland and tasteless for too long. And it really helps showcase some of the stunning meat available in the capital. Hawksmoor’s Ginger Pig partnership springs to mind. We’re in a new era of local rock star butchery, and this new breed of steakhouse is the venue. The key elements that make Goodman really good fun are all in the detail. The servers wear chef’s whites. It gives the unconscious illusion that they might be the one actually grilling the cut you choose from the selection tray. The tray itself is a masterstroke. I don’t think I’d ever order fillet steak normally, but the fact we could see just how marbled the fillet actually was is a huge selling point. It also gives you a visual guide as to what you can expect. I still struggle to think of beef metrically. Everything is branded. The entire room and everything in it has been given a great deal of thought. The knives. The tap water bottle. The plates. The waiting staff. It’s not subtle, but it’s pretty and it’s tasteful. They don’t skimp on portions. 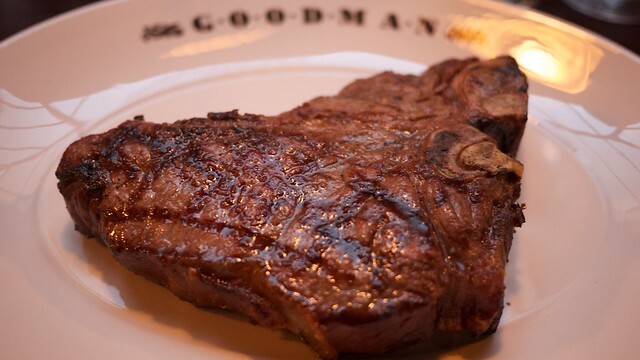 Sure, you pay for it, but just the fact you can order a 900g USDA porterhouse is immensely satisfying. The meat is impeccably cooked, provided you give enough detail when ordering (medium rare, but the rarer side of medium, not blue please). It’s well seasoned. The bearnaise has enough bite to it and doesn’t congeal too quickly. The stilton sauce is a richly reduced gravy, a country mile away from the gelatinous cheese sauce you’d expect otherwise. It all goes together brilliantly. The accompaniments are, like the meat, flawless. The truffle chips are crisp and fluffy, the mushrooms are doused in just enough garlic butter and the tomato salad actually has some really quality tomatoes in it. And a good tomato can be very hard to find. The only thing to really bring up is money. I’ve had a fair few discussions with beef fans who declare, with good reason, that they could just as easily go to O’Shea’s or the Ginger Pig or Allen’s of Mayfair and buy their own T-bone, rib eye or Porterhouse, take it home and grill it there. It’s a very good point. 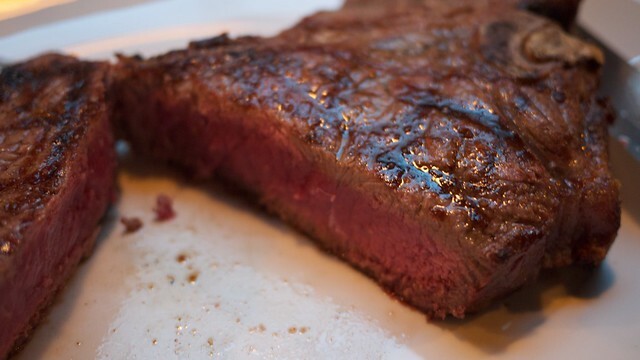 Steak isn’t hard to cook properly. Even with 50% off food it was still nudging £45 a head for a single course, some shared sides, a cocktail and a glass of Malbec (our desserts were comped due to a spot of inadvertent menu proof reading). It would have been £70 on a normal day. 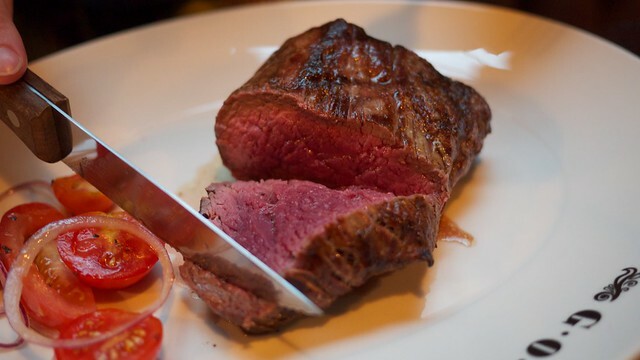 What makes it sting less is how good the experience is, but it’s priced for special occasion, and do you just want a steak when you’re paying that much money? Therefore I think Goodman falls squarely into the ‘awesome if on somebody else’s expenses’ bracket. Or just keep going back for the burger. At £12 it’s the star buy.